Here's one last Ponsian post before we return to the man from Baker Street. 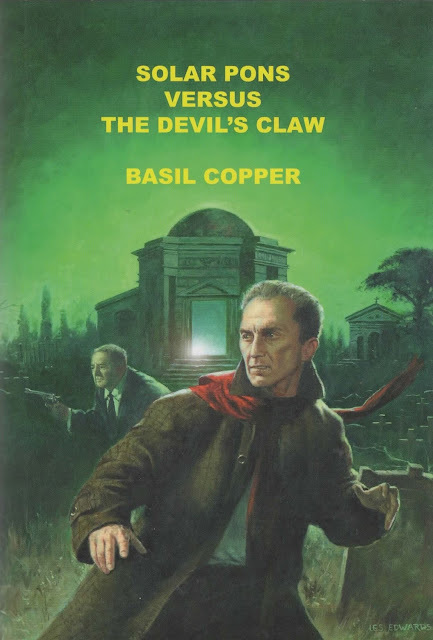 After breaking with the estate of August Derleth, Basil Copper continued to write and publish Solar Pons stories via small publishers. Solar Pons Versus the Devil's Claw was Copper's only feature length Pons novel. It was released in a limited edition in 2004 by Sarob Press and today sells for a premium. This is a dynamite book, standing out less from Copper's Pons tales only because so many of his approach novel length anyway. Hugh Mulvane spends most of the first quarter of the story regaling Pons with a freakish tale of his vile uncle Simon Hardcastle (love that name! ), who dies during a nightmarish ordeal in the creepy old cemetery of his grand Chalcroft Manor. Weird marks on the ground near the body––found also around a dead poacher some months earlier––revive a spooky legend, instilling fear among the superstitious citizenry. Mr. Mulvane is supposed to inherit, which places him in a difficult position, yet he's ostensibly keen to get to the bottom of the mystery. Pons agrees, he and Parker accompanying the young man to the estate and the scene of the crime. Only then, well into the book, with the aid of Inspector Stone of the Buckinghamshire C.I.D., does Pons plunge into the fray, sift the minutest physical clues, interrogate the suspects, none of whom seem at all likely. Peters the estate manager; his beautiful wife Sarita; the lovely Miss Masterson; Tidmarsh, music master at the local college; Angela the maid; what could any of them hope to gain from dirty deeds? So obscure is the situation that for a period it isn't clear that any major crime has been committed. Pons, however, starts shuffling the pieces of the puzzle, begins to fashion in his mind the shadowy image of an evil conspiracy. -From the essay The Adventures of Solar Pons by Jeffery Scott Sims. Also see: The Adventures of Solar Pons (1976), The Return of Solar Pons (1975), Mr. Fairlie's Final Journey (1976), The Dossier of Solar Pons (1979), The Further Adventures of Solar Pons (1979).